Hey Man I've been using your scripts for a while and just found your blog and am excited to read up on your tecniques. This is slightly off topic on this post but do you have any idea how to rearrange attributes in maya 2012, I used to use cbArrangeAttributes.mel but that doesn't seem to be working any more. 2, Duplicate the node with attributes to re-order. 4, This is where you start to re-order the attributes and ADD additional ones as required. Select the attribute that you want to transfer in the attributMan window then select the duplicate note and hit “Transfer Attrs” The attribute is copied with ALL EXISTING connections. Neat. 5, Continue as 4 and add additional attributes if required as you build the re-ordered attribute list. 6, Check all transferred attributes with connections are functioning as expected then delete the original node, rename duplicate node as required. I hope this helps others as much as it helps me. BTW the attribute re-ordering in the script worked up to Maya 2010 hence the above work around for 2011. Have you found that Ctrl-a only toggles the AE when it is docked with the Channel Box? I've found that for all other positions, it will only open the AE, but not close it. That is how it is working for me. An optionVar is set that remembers your choice when you disable the notes display. 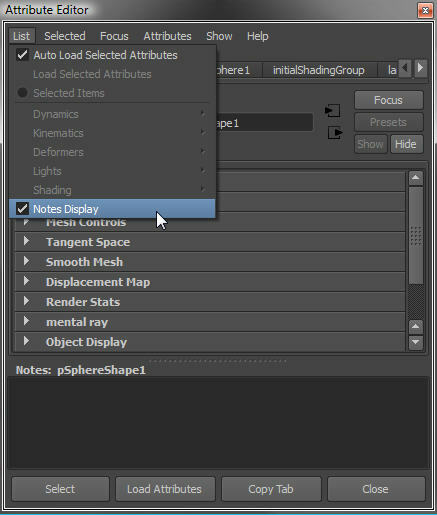 This will be saved in your prefs and reapplied when you restart maya. The only reason I can think of for it not working for you is that you are not saving your prefs. By default, prefs are saved when you exit maya. Maybe you disabled that? Also, when people run several maya sessions at the same time, prefs that get changed in one session, may be overwritten if another session is closed after the one where the pref got changed. Finally got around to installing this. Thanks as always, but in 2013 it isn't setting the var between sessions. Create Locator - Notes are displayed, menu item is unchecked. Check, then uncheck menu item, notes display is turned off. Restart Maya - same state as at beginning of procedure. Notes are off when procedure above is repeated. Well spotted! Its not that the var is not being set, it is that maya has decided to ignore it when it builds the editor. This is the price we pay for faster maya loading. However it was an easy fix. I added a line to force it to read the option var and update the display after the menu has been built. I added the update to the rar on the downloads page.